These are nice beach towels. They arrived quickly and I was very pleased with them. Kaufman - Oversize 40" X 70" Stripe Color Velour Soft Beach and Pool Towel. Dry off in luxury with the Turkish cotton beach towel by Salbakos Cabana. This oversized beach towel is made from 100-percent combed Turkish Aegean Cotton in twisted yarn construction for an absorbent and opulent experience. The vibrant color options adds to the liveliness of the bathroom and match with decor. 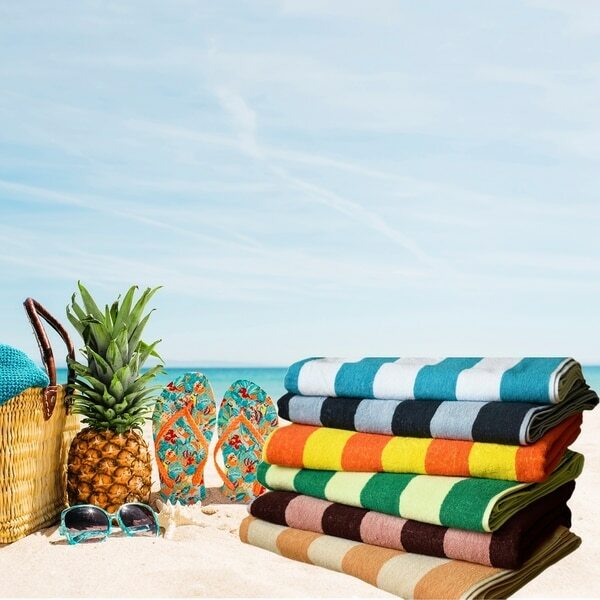 The heavy fabric of the large beach towels makes it perfect for beach days. The super soft material is gentle to the skin and provides luxurious experience. This high-quality beach towel has stripes running to the longer side of the towel. The quick dry beach towels are highly versatile, add to the perfect collection for kids or as guest towels. Dimensions 15.0 In. X 12.0 In. X 2.0 In. The towels pilled after one wash. They are nice and heavy but are now not nice to look at! I bought the blue towels and absolutely love them! The color is perfect and they are oversized which my guests loved! Bought 4 and will probably buy 4 more! I this towel for the beach. Served my purpose. Great!!!! Vibrant color and super soft. Very happy with this towel. Excellent buy! Perfect beach towels! Really good towels. A bit on the heavy side, but superb quality. You will feel pampered in these. Birthday gift for my daughter &amp; she loves it. "which way do the stripes go"
Hello sdfgwedrfgytawertg, the stripes go all the way on the long side . Thank you for shopping with us.